Things that this whole blogging thing is forcing me to do? Get my damnable pictures more up to date. How can I tell you about what I'm doing when the latest photos I have up on Flickr are two months old? In the upcoming week or next, I plan to blog about how summer feels more summery with my son around, how Lantern Moon is the bestest, and I'll give you another finished project in the form of a baby blanket, but in the meantime, here is a dose of squee from April! Our next door neighbors have a duck that has taken to nesting in their bushes during the spring. 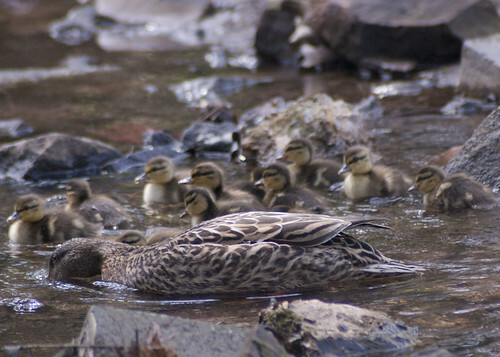 She comes, lays eggs, hatches them, and then she and her brood take off. We do our best to make sure that we see them! 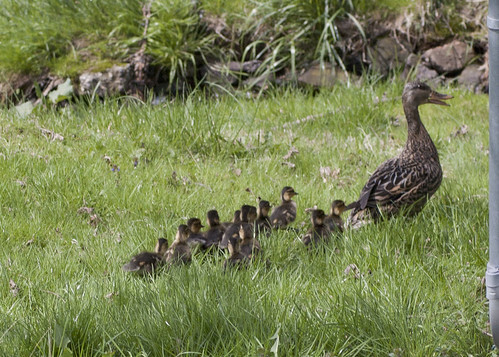 Here they are waddling to the creek in our backyards. 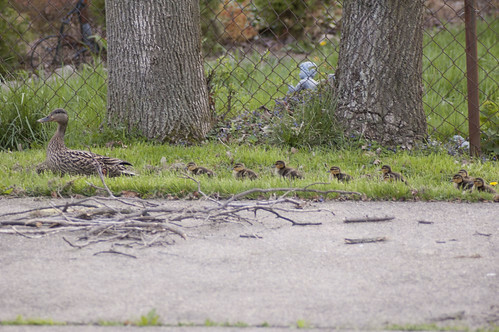 They had some trouble achieving this because at first the ducklings just squeezed under my neighbor's fence while the mother duck panicked like hell telling them to come back here right now or they'd be sorry. 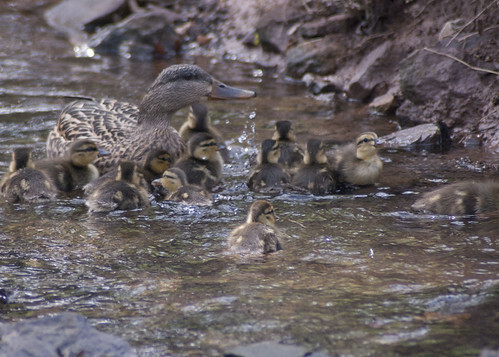 Once they had all gathered and got in the water, they were experts at only several hours old! They were quite keen to take off and we thought we had all seen the last of them. But momma duck came back for her last unhatched egg! So it was back up to the nest for one last overnight visit. Hopefully they are doing well!